Does VBCE accept credit cards as a method of payment? VBCE does not accept payment via credit card. Customers can pay with cash, debit card (Canadian banks only), or bank draft payable to VBCE. Does VBCE accept debit card as a method of payment? Yes, note that debit cards have a daily transaction limit; please ensure your limit is above your payment requirements. Does VBCE have service fees on top of their rates? 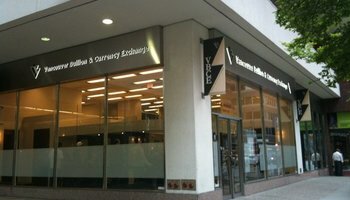 VBCE does not charge extra service fees on top of the posted exchange rates. Does VBCE cash Traveller's cheques (Canadian or Foreign) ? VBCE does not cash Traveller's cheques of any currency. Does VBCE accept foreign drafts for exchange? VBCE is not able to accept any foreign drafts because of strict compliance regimes around the world. We are able to receive electronic transfers in many foreign currencies. Please contact us for the currencies available and banking details. Does VBCE accept 3rd party CAD cheques? VBCE does not accept 3rd party CAD cheques. If you wish to pay with the same currency that you are sending, VBCE will charge a 2% fee plus applicable wire fees. 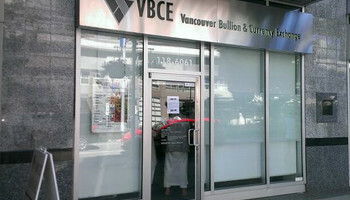 Does VBCE buy back outmoded foreign bank notes? There are a selection of outmoded bank notes that VBCE may buy at a discounted rate. Please call us to inquire. Please note, VBCE does not buy Euro Legacy Currencies. Does VBCE buy or sell foreign coins? VBCE does not buy or sell foreign coins. Does VBCE offer shipping or storage services for precious metals? Can I book a rate in advance for precious metals? VBCE operates on a live pricing system. At this time, we do not permit advanced bookings for precious metals due to market volatility. The final price will be set when you come in to make your purchase. Does VBCE buy gold or silver jewelry? Is VBCE open on the weekends? Our Richmond and Granville branches are open on Saturday from 10am - 4pm PT. Do I need to provide identification when I transact with VBCE? If you are exchanging banknotes equal to or in excess of $2,000 CAD, government issued picture identification is required. What if I am a Quebec resident? To set up a corporate account, please fill out the corporate account application form and return it via fax at 604-685-7923 or email info@vbce.ca along with a copy of your incorporation papers. Once received, a corporate account manager will contact you to complete the set-up process. If you have any questions or to further inquire please call the trading desk at 604-685-1008. How long does it take to open a corporate account? The process for setting up a corporate account is simple. Once we receive the completed application form, an account manager will call you shortly after (usually that day or next business day) to complete the set-up process. It likely takes anywhere from 1 -3 business days to complete the set-up. Do I need to set-up a corporate account in order to transact on behalf of my business? Yes, VBCE is required by law to have a completed service agreement and a copy of incorporation papers for all businesses that wish to transact with us. For further information regarding this, please refer to the Fintrac website. Does VBCE accept company cheques? Clients with business accounts may use business cheques at VBCE's discretion. Please complete the corporate account application and an account manager will contact you to discuss settlement methods. Does VBCE offer same day wire transfers? How long will it take my wire transfer to reach its destination? Yes, VBCE can offer same day wire transfers. Please inquire. It usually takes same day to 3 business days for the wire to reach its destination. Does VBCE offer delivery service? Yes, VBCE offers same day delivery to your business within the Lower Mainland provided orders are received by 10:30am PT. Can I transfer funds directly from my business bank account to VBCE and vice versa? There are a few financial institutions that VBCE can provide electronic funds transfers (EFT) with. Please inquire at 604-685-1008 to see if your institution qualifies. VBCE also offers a pre-authorized debit option at its discretion. This involves VBCE directly withdrawing or crediting your accounts, as per your authorization. What if I am a Quebec client? If you are in Quebec at the time of the transaction, unfortunately we are not able to complete a transaction with you as we are not registered in the province Quebec. If you are a Quebec client, you can still conduct face to face transactions at one of our branches. VBCE Online is an online booking platform. Once an exchange rate is booked and submitted VBCE will then electronically facilitate your transaction. Can I purchase foreign currency cash with VBCE Online? No, VBCE Online is for electronic settlements only. We transfer funds between bank accounts. Are there limits on how much I can exchange at one time on VBCE Online? Yes, it will depend on your method of payment. VBCE will notify you of your maximum limit per transaction when the account is set-up. What currencies can I exchange on VBCE Online? VBCE Online buys and sells the following major currencies: CAD, USD, Euros, British Pounds, Japanese Yen, and Australian Dollars. (Please note Euro, GBP, JPY, and AUD must be wired in to VBCE's accounts, no PAD available). Additionally, there are a variety of major and exotic currencies that VBCE can sell and wire out, however some currencies are restricted to a minimum amount. Upon set-up of your VBCE Online account, you can discuss which currencies you will require and we'll let you know if we can accommodate them. Can I use VBCE Online every day at any time? Yes, VBCE Online is available for trading 24 hours/day, 7 days/ week. There may be times when VBCE Online is not available, due to system maintenance. How will I know the exact amount that I owe for my exchange? Once you have logged onto your VBCE Online account, and have requested your exchange, the final amount owed will display before you confirm that you'd like to proceed with it. What if I have booked my exchange, but have changed my mind or made a mistake and I want to cancel or amend my transaction? Once a deal is booked, it is binding, so we expect you to honor the transaction. If a mistake has been made and you need to cancel or change your transaction, you must call us as soon as possible. VBCE does reserve the right to cancel your VBCE Online account should you frequently cancel transactions or do not honor your booked transaction. If I am paying with the bill payment or incoming wire option, how long do I have to get my funds to VBCE once I have booked my transaction? We prefer if you can transfer your funds to us the same day that you book your transaction. If your payment will be delayed, just give us a call and let us know, so our accounting department can make the proper adjustments on our end. I want to book an exchange that is outside my limit, can I still use VBCE Online to do this? Unfortunately no - But you can call us directly at 604-336-8086 Monday to Friday 8:00am – 5:00pm to book an exchange that is outside your VBCE Online limit. If you know you'll be requiring an increased limit for future transactions, you can speak with a VBCE representative and we'll let you know if we can increase your VBCE Online limit. Can I purchase precious metals using VBCE Online? Unfortunately No - VBCE Online is for currency exchange only. 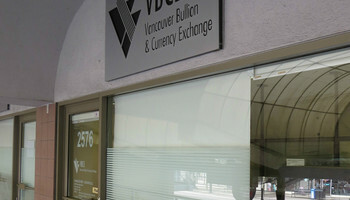 However for precious metals inquiries, please refer to our website www.vbce.ca or call our office at 604-685-1008.